I am happy to report that we have managed to successfully move the Raft from where it was bought to the Zandvlei Nature Reserve. ‘we’ actually means – the staff of the Nature Reserve! They moved it on Friday 6th April 2018. As we have seen from the videos and reports from people like Kevin Rack, plastic and other litter lodges in the reed beds and in virtually any place that it can be caught up. 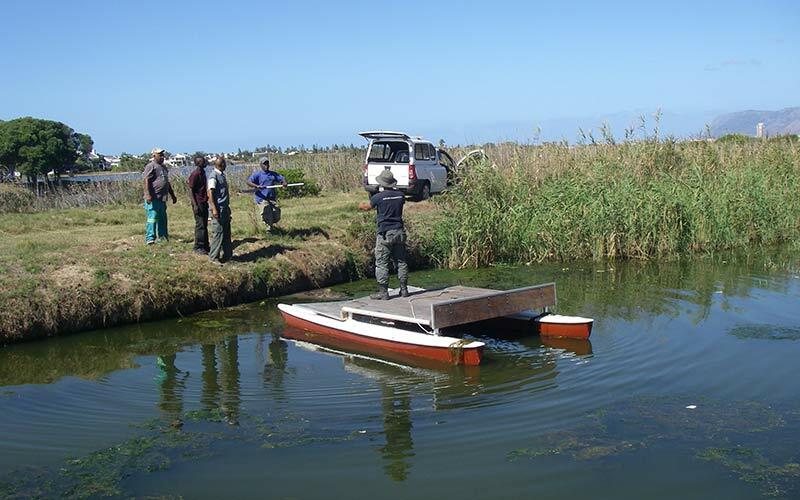 In discussions with Mark Arendse and the staff of the Reserve they expressed the need to have a water going vessel that they could access the reed beds from the water side to remove litter from the reeds. Fortunately there was a raft for sale from one of the residents of Marina da Gama and after some negotiating the Zandvlei Trust was fortunate to be able to buy the raft and donate it to the Reserve for their use in the ongoing battle against litter in Zandvlei. Hopefully this raft is going to answer their needs and is going to be put to good and regular use by the staff of the Reserve. In the mean time the raft is going into ‘dry dock’ for a short spell to have its bottom cleaned and a few other adjustments made to it so that it is perfect for their purpose. Thanks to all involved. It is much appreciated.